DJing the Locking/Waacking categories at Project X in April! Tricking Battles, Locking Battles, and Waacking Battles all under one roof! These styles have some of the most FIRE battles that we don’t see enough of. 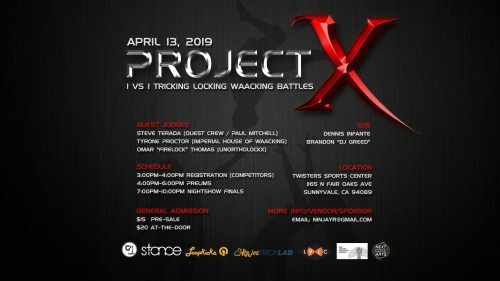 Project X is an event inspired by the community to create inspiration and competition to progress the movement of our active communities of Trickers, Lockers, and Waackers. *Those who are competing or wanting to see the prelims and session with our competitors can arrive during the day at 3:00pm. *Competitors, please see the description below for the category you are entering, so that you come prepared and know what to expect for the battle.